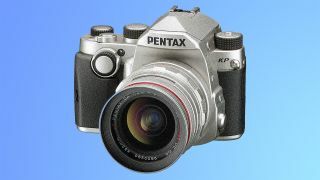 Ricoh has introduced the Pentax KP, a tiny titan of a DSLR with a maximum ISO of 819,200. Yes, you read that right: ISO819,000. At that sensitivity the Pentax KP turns into a virtual black hole that just absorbs light – which is exactly what it’s been designed to do, as a camera for night photography. Equipped with an 24.32MP APS-C CMOS sensor, the Pentax KP can capture the stars even on the darkest of nights. At the same time the DSLR can correct for the rotation of the Earth during long exposures using its in-body SR II 5-Axis shake reduction system with the help of an optional GPS module, so that stars are captured as points of light rather than star trails. Of course the camera can also use the same stabilization system to correct for unwanted camera shake, with Ricoh claiming up to five stops of assistance. Further bolstering the Pentax KP’s low-light shooting capabilities is a SAFOX 11 AF sensor, which offers 27 focus points and 25 cross-type AF points in the center. The autofocus sensor comes with the usual accoutrements of tracking modes, but the biggest highlight is its ability to focus in near darkness at -3 EV. Aside from shooting in the dark, the Pentax KP has been built for speed, with an 1/24000-second electronic shutter. The onboard Prime IV imaging engine also helps cut noise on the fly and optimize image resolution. As with other Pentax DSLRs, the KP can stand up to the elements and temperatures as low as -10-degrees Celsius thanks to its 67 weather seals. Other features include Wi-Fi connectivity, a 0.95x optical viewfinder and a 3-inch 921k-dot tiltable monitor for overhead and low-angle shots. Altogether, the Pentax KP looks like a real beast of the night and the only other camera that comes close to beating it is the Sony A7S II. Unlike the 24.32MP APS-C Pentax KP, the Sony A7S II features a full-frame 12MP sensor that tops out at ISO409,600. It’ll be interesting to see how these two low-light champions stack up against each other. The Pentax KP will be available in the US on February 25 and in the UK by the end of the same month, priced at $1,099 / £1,099 (about AU$1,450) body-only.